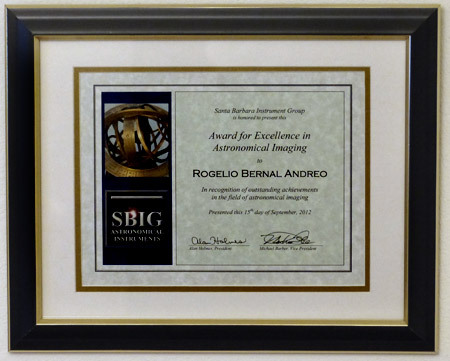 Was added to SBIGs Hall of Fame and received SBIG's Award for Excellence in Astronomical Imaging in 2011. Although the current description of this award in their web site is a bit vague, SBIG has described their Hall of Fame to be a recognition given to imagers who push the envelope in amateur astronomy. 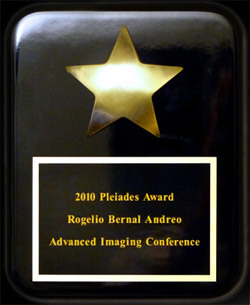 Received the 2010 Pleiades Award from the Advanced Imaging Conference Board of Directors in December 2010. The Pleiades Award is an award for "rising star astrophotographers". Received the 2011 AANC Amateur Award from the Astronomical Asociation of Northern California, for "outstanding and continuous support in distinguishing and fostering Amateur Astronomy". Several of my images have appeared in magazines and publications such as Astronomy Magazine, Sky and Telescope, Ciel et Espace, National Geographic, etc. and TV programs for TV channels such as the BBC, National Geographic or The Discovery Channel. Winner in the Deep Sky category for the 2009 Astroimaging Contest, by Astronomy Magazine. 2010 Astrophotographer of the Year, by the Royal Observatory of Greenwich, Deep Sky Winner. 2011 Astrophotographer of the Year, by the Royal Observatory of Greenwich, Highly-commended entry (3rd shared place) in the Deep Sky category. 2012 Astrophotographer of the Year, by the Royal Observatory of Greenwich, Second place in the Deep Sky category. 2013 Astrophotographer of the Year, by the Royal Observatory of Greenwich, shortlisted entry (Top 10 for the category). 2014 Astrophotographer of the Year, by the Royal Observatory of Greenwich, Highly Commended (3rd shared place) in the Deep Sky Category. In all, five significant results, five years in a row in this highly regarded contest. Two of my Orion wide field images were used in the Orion's flyby scene for the Hubble 3D movie (by the way, if you haven't seen the movie, you should!). This was kind of cool because they actually transformed my flat 2D image into a 3D stellar field! Some of my images, such as the Witch Head and Rigel, have been used in the Discovery Channel series Into the Universe with Stephen Hawking. The Orion's Deep Wide Field image showcased at the Rubin Museum in New York City for 6 months, between December 2009 and May 2010 during their "Vision of the Cosmos" exhibit. Many of my images have appeared in calendars from different sources. Perhaps one of the ones I am most proud of, leaving aside religious ideologies, was the addition of one of my images to the Vatican Observatory Calendar. Too many to mention individually, many observatories, planetariums, books, including book covers, and other media have used some of my images in one way or another. The Orion, From Head to Toes image was selected by Bad Astronomy (Discover Magazine) as the #1 top astronomy picture of 2010. This was also the first time this award was given to an amateur image, which in previous years it was always given to images produced by professional observatories or space telescopes. Out of the other 13 images that made it to the top list, only one was also produced by an amateur astrophotographer, being the remaining 12 images from professional and space observatories. Anytime we embrace a career, a hobby or something we like, we often thrive to become better at it. Some disciplines encourage competition against others. Astrophotography is not one of them. Sure, some people may want to produce better images than such or such person, but what does better mean in a discipline where you are reflecting in an image your own interpretation of what's being photographed? I will never produce an image of an object that is simply better (or for that matter, worst) than other astrophotographers, no matter how skilled or how novice they are, because astrophotography is not about everyone portraying the same image with the only differential variable being "quality". Yes, quality matters, and it takes time, experience and skills, but fortunately, it is not the only variable in an astrophoto. Personal goals matter as much as anything else, and if there's one thing about personal goals is that they are, well, personal. How do you measure that, against others? You can't. As such, the true astrophotographer only competes against him/herself, so that your next image poses challenges that if you can overcome, it demonstrates you've become a bit better than you were last time. Again, better here needs to be measured against your own goals. I've said time and again, astrophotographers should not look upon other colleagues as a reference, but if anything, as an inspiration for a job well done. Your work becomes yours only when you aim to produce images that meet your goals and standards, not the goals and standards of others. Sometimes it is what others say or do what let you know that your work did stand out, for whatever reason. Recognition is nothing but the feedback of others letting you know that something you did, sometimes, was worth doing for something more than your personal satisfaction. And that too can be cool. hola rogelio me gusta tu filosofia y tus fotos,saludos desde suiza campeon!!! Gracias por el comentario Juan y por pasarte por aqui! Congrats on all your past and recent achievements Rogelio , I always have more respect for you because of the fact that you have done all this as a Nomadic Astrophotographer and theres not many of us left. Rogelio,a truly wonderful shot!I never imagined the Hyades to be surrounded by dust. Thanks Erik, yes, we're a rare bunch indeed! Louie, thanks for the comment as well, glad you like it! Notice that the dust in the image of the Hyades is galactic cirrus, that is, it is not dust that surrounds the cluster, like for example it happens with the Pleiades. Rogelio, me siento contenta y sorprendida por tantos logros en tan poco tiempo, he seguido tus progreso desde que diste tus primeros pasos en astrofotografía y cada exito tuyo por alguna razón me provoca gran contento. Me permites llevar estos logros tuyos a La FADD? Me podrías decir el nombre de la película que estas recomendando verla? se llama Orión o tiene otro nombre, espero tu respuesta a ambas preguntas y nuevamente felicidades. Do you know that your email doesn't work. I am trying to contact you. Your website is very fantastic, great pictures ! Thanks Frank, I'm very glad you like it! Big fan! I just made the cover of the AL League Reflector, but I look at your stuff and realize I have a ways to go. Keep up the widefield stuff! Absolutely incredible pictures. A visual treat indeed!